The exterior of your home should reflect your tastes, as well as the interior. 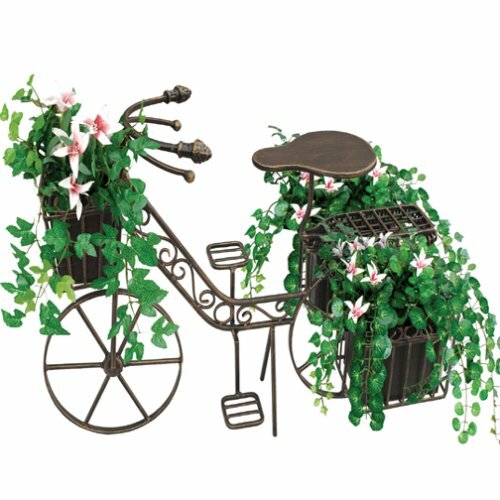 This bicycle plant stand allows you to display your outdoor plants and flowers in style. It offers a rustic appeal to the exterior space of your tiny house. This unique decor will add style and interest to your outdoor living space. It will hold one small plant in each planter area. Perfect for smaller outdoor, and even indoor spaces. Here are some more items that will dress up your outdoor living space around your tiny house. You could consider a theme such as farm, tropical, bohemian, or eclectic, or mix and match items and colors that make you happy.